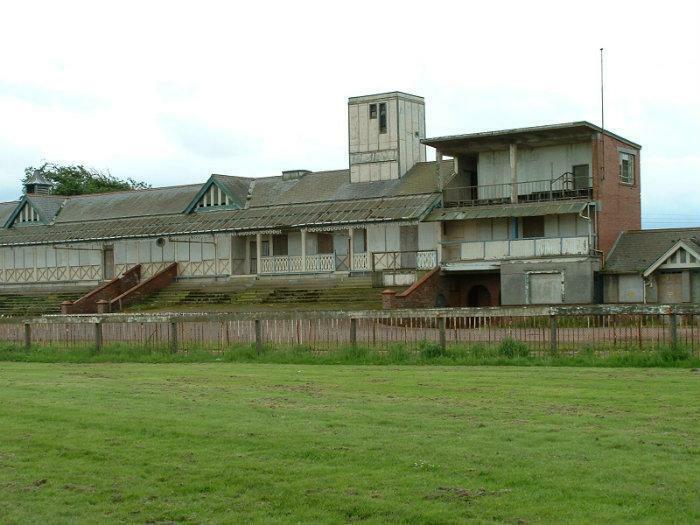 Lanark Racecourse where the first cross-country championship was held. Racing was conducted here until 1977 and for several years the course was walkable: it is now country park. AP Findlay was the first Scottish national cross-country champion and was a stone mason from Ayr (Home address: 66 Main Street, Ayr). A football player and runner, he won titles over the country and on the track, and when the Ayr Section of Clydesdale Harriers became independent of the parent club, it was marked with a joint run at which Findlay represented the new club as its first president. Clydesdale Harriers had been founded in May 1885 and Edinburgh Harriers in September of that year and it natural that some kind of inter-club contest be arranged. It was set up and organised by a sub-committee of the SAAA to be held at Lanark Racecourse on 13th March 1886. Eleven runners took part – seven from Edinburgh and four from Clydesdale. The race started at 4:15 in pouring rain and Colin Shields tells us that total gate receipts were 2/- (ie 10p). With admission charges of 6d, there must have been four paying spectators watching eleven men who were running for over an hour passing before then three or four times! Findlay, who was at that time mainly a football player, led the field through 10 miles of heavy grassland and won in 62:57 with DS Duncan of Edinburgh second. There were complaints that the course was under-distance – a charge rebutted in no uncertain fashion by DS Duncan who said that “the course was over 10 miles and up to a dozen Scots runners could cover 10 miles in under an hour.” When news of Findlay’s win reached his home town of Ayr, preparations were made to meet him off the Glasgow train which would arrive at 9:12 pm. He was not on that train so an even bigger crowd turned out to meet the next train at 11:20 pm, but again there was no Findlay so the crowd just went home. Next morning Findlay arrived at 7:40 having walked from Barrhead to Kilmarnock to catch the first train to Ayr on the Sunday morning. He did not run in the National Championship in season 1886/87 but won two SAAA track titles in 1887. Running as he often did during the summer under the banner of Ayr Football Club, Findlay won the inaugural championship over Four Miles on 25th June, 1887, at the SAAA Championships at Hampden Park in 21:30. John Keddie has this to say about the race (and about Findlay): “The first four mile champion was AP Findlay (Ayr FC). He was already the 10 miles champion and record holder for all distances from 3 miles to 10 miles, except, oddly enough, the 4 miles, but his records had all been set in a 10 miles race, whereas the four miles record (21:16.6) had been set by WM Gabriel (EUAC) in a 4 mile race. By the next championship Findlay, a small even paced sort of runner, had emigrated to the USA.” Findlay won the Ten Miles for the second successive year on 27th June at Powderhall in 55:21.6 from W Henderson. 2. Athletes must have completed 5 qualifying Saturday runs from club headquarters before being eligible to represent the club in National championships. This was seen by Clydesdale Harriers as unacceptable and they set up their own body – the Scottish Harriers Union – and held their own championships with sections racing against each other but refused to join the SCCA. They did however run in the SCCA championships since this was the only real race of the winter. In season 1887/88, the club championships were held at the Racecourse Paisley and Headquarters ran against all sections with the exception of Falkirk fielding teams of 10 (5 to count). It was intended to be over 8 miles but after the first mile was covered in 5 minutes, the trail was accidentally lengthened to 12 miles. Findlay won by 2 seconds from R Graham with W Henderson 2 minutes behind him. The official national championships were held at Hawkhill Park in Leith and again Findlay won. Shields describes the race as follows: “An excellent event was held at Hawkhill with seven of the runners in the inaugural 1886 championship competing. Four clubs contested the championship – Clydesdale, Edinburgh, West of Scotland and Kilmarnock – covering a varied 2 lap nine mile course. The runners covered 600 yards of the cinder track, onto Restalrig Road, across ploughed fields to Craigentinny Farm passing by St Margarets Gasworks and Lochend Road to enter by the main gate. AP Findlay led from the start, being closely followed by a pack of 6 Clydesdale Harriers and A Robertson (Edinburgh). Findlay eventually finished a clear winner with Clydesdale scoring an overwhelming victory with 23 points.” Andrew Hannah was second and J Campbell third. A bit more detail about the race was given by George Dallas in ’50 Years of Athletics’: “When Findlay won again in 1888 all the runners went off the trail and Findlay was blamed (probably unjustly) for leading the field astray. He could keep going indefinitely and the competitors ran about 16 miles that day – some arriving back in cabs and other conveyances. One or two had to have their shoes cut off in the main streets of Ayr and finished barefooted in the snow and slush and darkness.” An interesting description – especially the bit about runners in Ayr when Shields tells us that the race was run in Leith! He continued his good form into the summer and again won the Ten Miles title – the third successive win.. This was won on 7th April at Powderhall in 55:33 from DS Duncan and P Addison. Unfortunately, when he was running well again, as has been noted above Findlay emigrated to America and Scotland lost another talented distance runner.